The Persephone Post is a great blog run by the Persephone Press in London. We have mentioned them before in our post on Daisy Ashford. At Cookbook Of The Day we have posted about several of their cookery books including; Good Food on the Aga, Kitchen Essays by Agnes Jekyll, and They Can't Ration These. The blog features a picture an a blurb about it. Quite simple but always thought provoking. They very often feature something near and dear to the hearts and minds of Lucindaville. This painting of Edith Olivier is one of them. Not only is it Edith Olivier but it was painted by Rex Whistler. 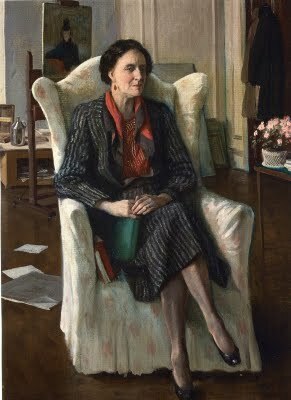 And in the painting Edith Olivier is surrounded by books and we love images of women reading! Wonderful painting! this guy haves an amazing technique, there's no doubt about that.